Born in the timber colony of New Brunswick, Maine, in 1848, Andrew Benoni Hammond got off to an inauspicious start as a teenage lumberjack. By his death in 1934, Hammond had built an empire of wood that stretched from Puget Sound to Arizona--and in the process had reshaped the American West and the nation's way of doing business. 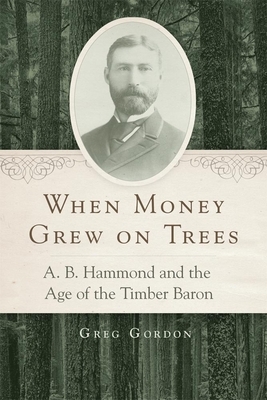 When Money Grew on Trees follows Hammond from the rough-and-tumble world of mid-nineteenth-century New Brunswick to frontier Montana and the forests of Northern California--from lowly lumberjack to unrivaled timber baron. Although he began his career as a pioneer entrepreneur, Hammond, unlike many of his associates, successfully negotiated the transition to corporate businessman. Against the backdrop of western expansion and nation-building, his life dramatically demonstrates how individuals--more than the impersonal forces of political economy--shaped capitalism in this country, and in doing so, transformed the forests of the West from functioning natural ecosystems into industrial landscapes. In revealing Hammond's instrumental role in converting the nation's public domain into private wealth, historian Greg Gordon also shows how the struggle over natural resources gave rise to the two most pervasive forces in modern American life: the federal government and the modern corporation. Combining environmental, labor, and business history with biography, When Money Grew on Trees challenges the conventional view that the development and exploitation of the western United States was dictated from the East Coast. The West, Gordon suggests, was perfectly capable of exploiting itself, and in his book we see how Hammond and other regional entrepreneurs dammed rivers, logged forests, and leveled mountains in just a few decades. Hammond and his like also built cities, towns, and a vast transportation network of steamships and railroads to export natural resources and import manufactured goods. In short, they established much of the modern American state and economy.